Memberships has gone bananas! 😛 Just over a month ago we announced our first add-ons for WooCommerce Memberships, and now we’re already doubling down with a new premium add-on to combine the powers of Memberships with MailChimp! MailChimp for WooCommerce Memberships allows you to synchronize your members with any MailChimp list, and segment members according to plan and membership status. We know many of our customers share the same drive to communicate well with their customers. It was you, our beloved Memberships users, that suggested an integration with MailChimp, to help you facilitate better communication with your members. In fact, we received over 70 votes for this idea here and here. A MailChimp integration was a perfect candidate for being developed as a Memberships add-on. As mentioned earlier, there are multiple advantages to this model: the core Memberships plugin can receive features that are essential to enrich the product we envisioned nearly four years ago, while features meant to help smaller subsets of users, only address specific use cases, or integrate with third party services, can be handled by separate add-ons, like Teams for Memberships. In this way, users not needing these features don’t have to pay for them, while our development and support resources can be efficiently channeled and distributed accordingly. Enough with explanations! Let’s get down to business and proceed with the unboxing of MailChimp for WooCommerce Memberships! The idea behind this integration add-on is as simple as it is powerful: automatically sync members to your MailChimp list. Once installed and activated, MailChimp for Memberships will add a new menu item in the WooCommerce Memberships tab screen. You will need a MailChimp API key to connect Memberships with MailChimp to get started. This is easy to configure. Head over the MailChimp guide to generating an API key for instructions. Once you’ve obtained a key, copy it in the corresponding field in MailChimp for Memberships, and you’re off to the races. ? As soon as the add-on connects to MailChimp, you can choose the MailChimp list to which you want to synchronize your members. After you choose a list, you can assign a merge field tag matching each plan you have in your Memberships installation. Once settings are saved, MailChimp for Memberships will start syncing your members with your chosen list as new members are created or updated, or even deleted, in your WooCommerce installation. This means that, whenever there is a membership status change for a member of your site, their membership status will be automatically reflected in their corresponding merge field in MailChimp! These extra settings tell the add-on what to do when a membership or a plan is deleted; this doesn’t happen frequently on the average Memberships site, but these settings will handle deletion if required. Finally, you’ll see a button to manually sync your members. On a new site you won’t need this, but for sites already using Memberships, it’s useful to sync members that existed before you installed MailChimp for Memberships (without waiting for a member status change to trigger synchronization). Another usage for this button is if you have changed the selected MailChimp list or edited merge fields after some users have been synced already (in this case, we recommend reading the documentation first). Without even looking at the Memberships dashboard in WordPress, we can already tell we are looking at the profile of an active member of the Gold membership plan! By default, MailChimp for WooCommerce Memberships will automatically generate a merge field tag for each plan you have configured when connecting to MailChimp for the first time. A merge field tag will also be generated upon creating a new plan later on. The tag label will be based on the plan’s slug, matching the style of other common merge field tags bundled by MailChimp itself when you create a new list there. 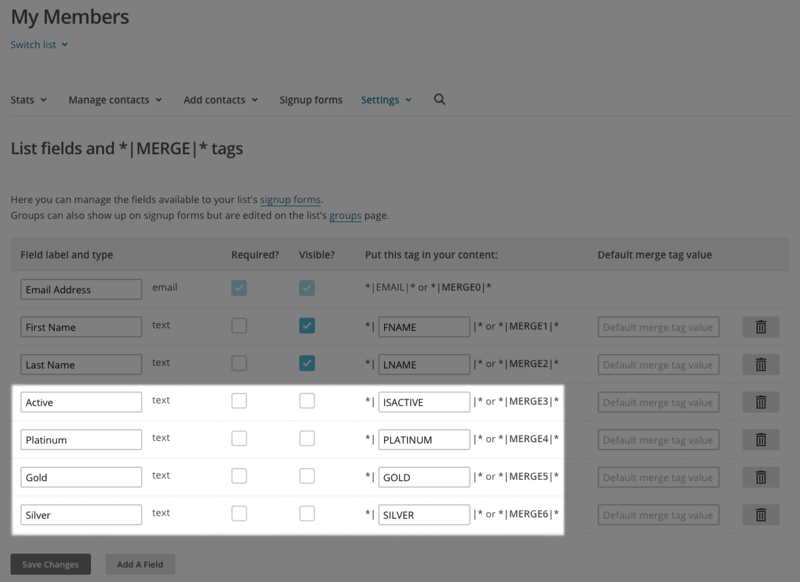 The newly created merge fields on Memberships will be pushed into MailChimp, as shown in the screenshot below. You can edit or replace these with others you have created in MailChimp, as you see fit. But consider that, should you update or change these labels on MailChimp’s end in the future, you may have to update and re-sync these old members who were already associated with older tags. To keep things easy, it’s a good idea to stick with a merge tag from the start. 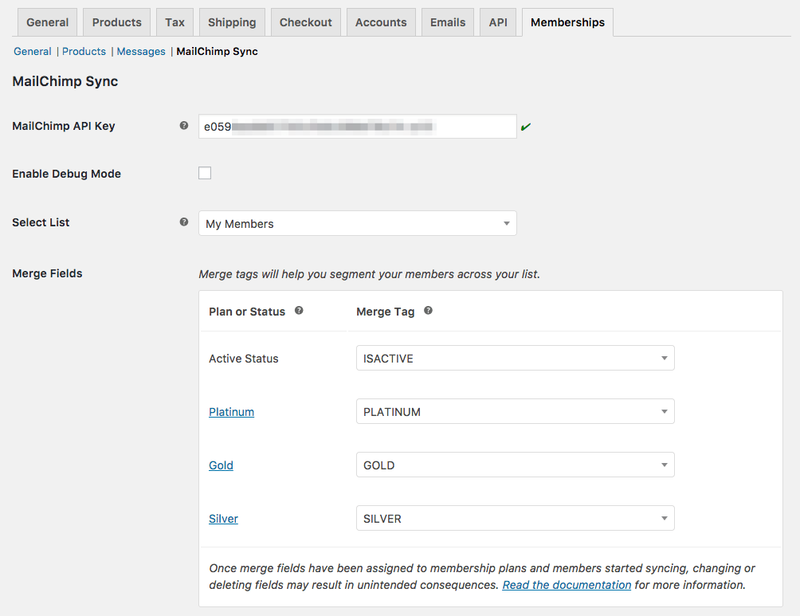 You may have noticed that in the MailChimp Sync settings under the WooCommerce Memberships tab there is also one particular merge field that does not match any plan. We call this tag the “Active Status” merge field tag (by default labeled as “ISACTIVE”) and it encompasses members of any plan. It will help you in segmenting for all members that are active (their membership has active status) versus those who are not (e.g. paused, cancelled, expired…), regardless of the plan(s) they are member of. 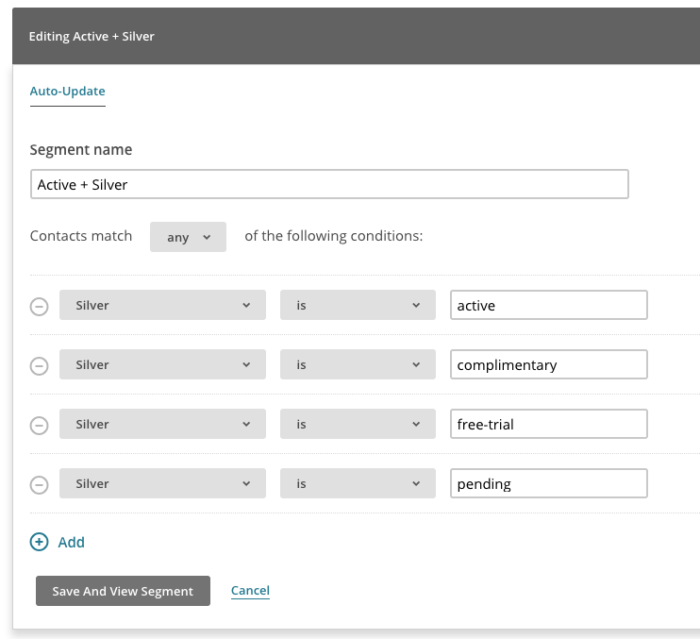 MailChimp for WooCommerce Memberships also lets you create email campaigns or engage with specific groups of members based on membership plan and status. 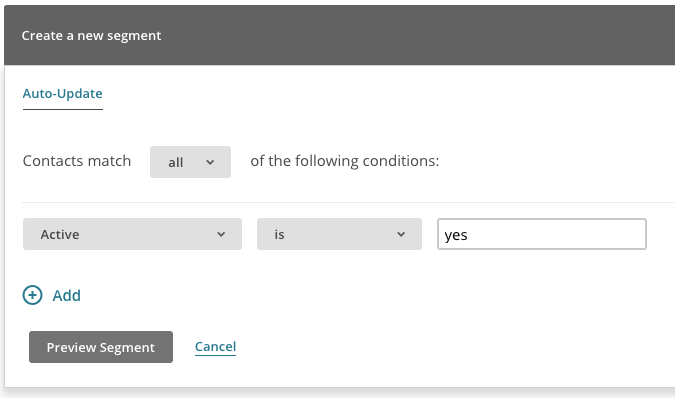 The first column designates a merge field tag matching a certain plan, and you can enter the corresponding membership status that you wish to target in this segment. In the example above, we’d email expired members of the Silver and Gold plan. This could be used to help you win back these ex-members, offer them some perk to entice them to renew their membership, or prompt them for feedback on why they did not renew. You could use a segment like this to inform these members of new perks just for them. The content for the ISACTIVE merge field tag is either “yes” or “no”, in this case. 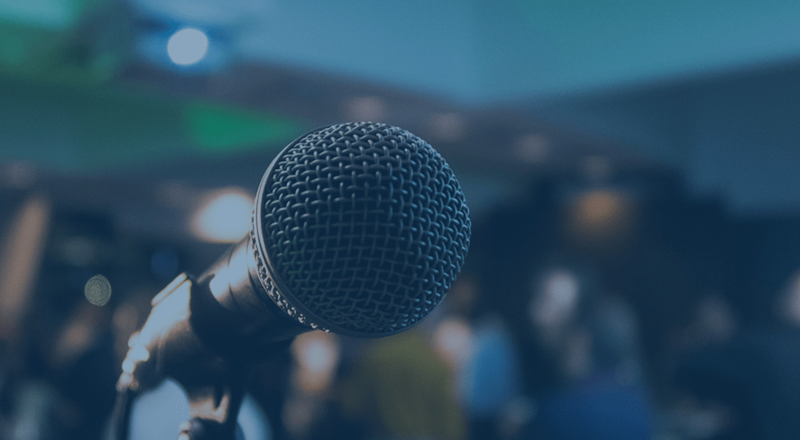 We are very excited to launch our second premium add-on for Memberships, and we’re even more excited to hear feedback from merchants who use this plugin to improve communication with their members! Chase is a WordPress engineer at SkyVerge, most often found mastering payment gateways and other integrations with WooCommerce. He builds new plugins, maintains existing ones, and helps support WooCommerce merchants. 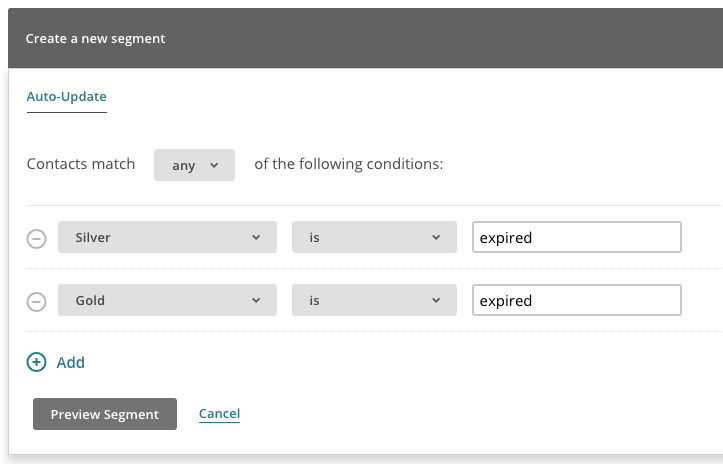 MailChimp automations can be triggered by field changes. So I can imagine sending lesson alerts to members who sign up for a course. Is it possible to automatically add users to a membership plan after they opt in to my mailing list (via Gravity Forms)? Hey Sharon, this a neat thought — unfortunately this isn’t possible, as members must have an account on the site, and submitting a form doesn’t guarantee this. However, if you do use Gravity Forms + the User Registration add-on, you can create a plan that grants access upon registration, and this will work! Fantastic! Membership status will be automatically reflected in the corresponding merge field in MailChimp, whenever there is a membership status change for a member of my site. I love it! Whooo! Us, too. 🙂 Let us know if you have questions as you get up and running, Dan! Based on the example above it looks like I can manually send out a promotion to expired members, but how would I go about creating an expiration notice that goes out as soon as someone’s account expires? It would also be great to create a warning email notification like a week or two before as well, and an additional reminder a couple of weeks after the expiration. Is this currently possible? Hey Marc, you could do this within the plugin, see details here. This gives you one pre-expiration and one post-expiration email. This isn’t really possible within Mailchimp, as to use an date automation, we’d need an end date merge field synced to Mailchimp. While this could have been useful for sites with a single membership plan, it’s not really feasible as soon as a site has more than one plan, as we’d need a different end date merge field for every single plan, and Mailchimp limits lists to 35 merge fields total (we see a lot of sites with a dozen or so plans, we’d definitely hit this limit). So, if you’d like to do more advanced emails or a series of emails after expiration, I’d have a look at the Jilt integration for Memberships instead, which is more flexible for these kind of emails. Thanks Beka, I originally reached out to Skyverge about using the built in tools to send expiration notices to only one of my Membership plans instead of both and they pointed me here. I’ll try Jilt instead, thanks!